It’s not a term I use. The word ‘naughty’ doesn’t solve anything or help anyone. It has become one of those general descriptors, a label. Back when I completed my Masters of Education I specialised in behaviour. I have always found the way that humans act and respond to circumstances as fascinating. At the time I concluded that every behaviour displayed is usually there for a reason. Our job as educators is to find that out. On the weekend I read yet another story of a young person who found that he didn’t seem to fit at school*. 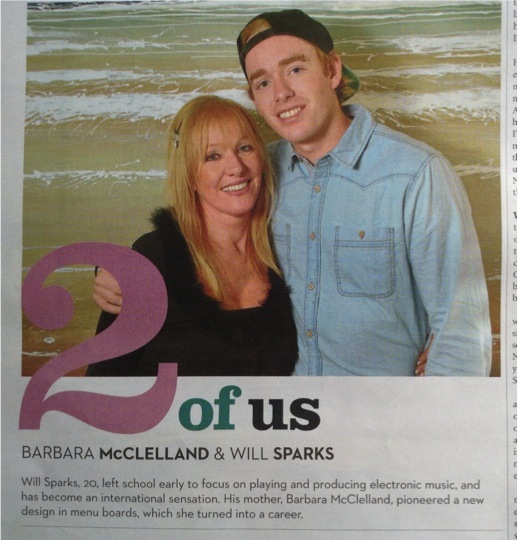 ‘2 of Us’ is a regular column in my newspaper’s Saturday supplement. Will and his mother, Barbara, told their story. I was particularly interested in Will’s story, a young person with unique talent that didn’t seem to fit at school. Will was definitely not the teacher’s pet. He spent a lot of time standing outside the classroom door or headmaster’s office – just for trivial things, nothing serious… I drove him to school every day of his life – otherwise he would never have been there on time. His early life was dogged by poor eyesight that was undetected until he put on a pair of magnifiers and then his whole world changed. He was able to play the guitar faster and faster, without missing a note and ended up with a whole group of people watching. A teacher at [his] High School told me that it was a shame Will didn’t apply himself to his schoolwork because he could do anything he wanted to. The irony of the situation is that he was doing what he wanted, and music and technology was the spark that started his remarkable career. He changed to another school, but left before completing his final year. However, he had been visiting music clubs and taken it upon himself to arrange lessons. Today Will is an extraordinary music producer. He is producing tracks for some of the most famous people in the industry. Recently he toured 30 American cities and made a seven week tour of Europe with his music. My dream is that school is a place for all young people to thrive. That instead of Will, and young people like him, seeking his inspiration outside of school, they would be inspired and excited to be at school. The learning, the physical environment and the style of teaching should converge to create the perfect storm for learning – with the capacity of meeting the interests and learning styles of all students. Perhaps then we may see those described as ‘naughty’ as engaged, inspired and able to pursue their passion. And school would be a place with the tools, technology and flexibility to make it happen. *I know that there are always other perspectives to a story, but I’m just going with what I read in this article.